Home » Blog » It’s time to taste the exotic seasonal fruits of Sri Lanka! Yes, it is that time of the year again where you will see the sides of roads all across the island lined with towered layers of colorful fruits. If you are visiting Sri Lanka anytime between June-August, you HAVE to try these exotic seasonal fruits of Sri Lanka. Rambutan is the fruit that dominated the island during this season. It has a leathery ruby reddish skin which is topped with flexible needles, and the fruit gets its name from a Malay word ‘rambut’, which means hairs. Some hard work is needed to peel off the tough skin but you are rewarded with juicy flesh (similar to the texture of grapes) covering a seed (similar to lychee). The primary region that rambutan comes from is Malwana – with plenty of trees growing and people residing in the region owning at least 1-2 trees. This fruit ripens on the tree itself hence cannot be plucked in advance. Vendors purchase the fruit from tree owners and distribute them around the country. At the beginning of the season, the fruit is priced at about 10-12 LKR and these prices decline gradually as the season draws to an end. Rambutan is rich in vitamins and minerals and is one of the safest options out there because no other chemical is injected into the making of the fruit. Eating five rambutans a day is said to decrease the chances of fatal diseases such as cancer. It also helps in preventing diarrhea and in reducing blood pressure. The portability of the fruit makes it popular with travelers who also use it as a great thirst quencher. Once the rambutan indulgence is complete, responsibly dispose off the shells because these are a breeding ground for Dengue mosquitoes. So while enjoying the fruity goodness, do your bit to help keep the country clean. 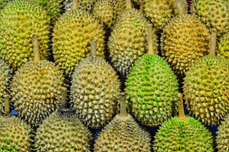 The other exotic fruit indulgence is Durian – which is not only limited to Sri Lanka but is also popular around the world as the “King of Fruits”. When you’ve had your first tasting of this fruit – the conclusion will be that you will either love it or hate it. This is because of the strong, distinctive flavor and smell of the fruit. In fact, for this reason, Durians are banned from certain hotels and most public transportation across South-East Asia. You will see durians stacked right next to the Rambutans on road sides during your tour of Sri Lanka. They are much bigger in size and they have a geryish green thorny husk. Inside, you will taste some creamy, custard like white flesh, very similar to Jackfruit. Joining these two seasonal fruits is the purple colored Mangosteen – which is supposed to be wine-red when ripe and is found mostly in dry zone areas such as Kalutara, Kegalle, Kandy, Matale and Gampaha. About the size of a tangerine, the soft coating of the fruit can be easily pressed and ripped apart, opening its way to the actual sphere shaped mangosteen which is neatly sliced by nature into wedges, thereby making it very easy to consume. The flavor is mildly sweet with a bit of zing. Be careful not to let the juice of the skin and the fruit drip onto your clothes as the stain is irrevocable. This fruit is also available in a few other countries including Indonesia, Thailand, Malaysia and India. South East Asia refers to mangosteen as the Queen of Fruits with trees going as high as 20-60 feet. While the fruit does have some medicinal value for treating certain skin problems, eating too much may be too heaty for your body, resulting in rashes and such.